Made by an acupuncturist for his daughter's eczema, this itchy eczema treatment by Emily Skin Soothers contains only the most natural ingredients of the highest quality. It contains just three Chinese herbs in a base of olive oil and beeswax to soothe dry skin conditions. Embrace the calming nature of Emily's Baby & Adult Skin Soother - use it as an itchy eczema treatment and your skin will thank you! Provides relief for eczema, keratosis pilaris, and rosacea-like redness. Calms dry and itchy rashes. Melt down to use as treatment for cradle cap or seborrheic dermatitis. Works best when used with the Skin Soothing Soap for Eczema or Natural Body Wash for Eczema. Free from colorants, artificial fragrances, preservatives, and chemicals. Not sure which products is right for you? 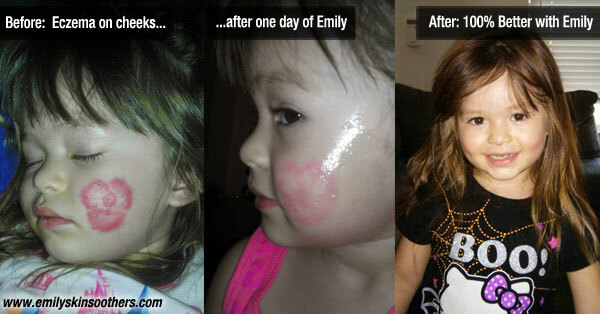 Try our Emily Skin Soother Sample 3-Pack.